Scott Nelles' retro-style sculpture/bank lands a money-minding spaceman on your desktop. In the 1950s, moon landings were just science fiction. But space travel was going to happen for real, and people were pumped. We may be further along in space exploration now, but today's spacecraft aren't nearly as charming as the ones envisioned decades ago in books, TV and movies like Forbidden Planet and Assignment: Outer Space. Scott Nelles' sculpture has zoomed back to the future in high retro style to refresh that innocent, mid-twentieth century excitement. Cast of recycled aluminum and bronze, its nose cone folds back to reveal a little bronze spaceman who just happens to hide a coin slot. Put your pocket change in it every night. When it's full, treat yourself to a 3D sci-fi flick. Made in Traverse City, Michigan. Scott Nelles works with bronze and aluminum using one of the most time-tested processes in existence: sand casting. This process involves building the object's shape from packed sand and then filling the cavity with molten metal. This process produces a subtle texture that adds to the character of each piece, making them seem handmade yet straight from the machine age. Nelles' fascination with metal casting and clay sculpting began as a young boy. He began his 30-year career by educating himself at Western Michigan University, Oakland Community College and The Center for Creative Studies. Of metal, he states, "I have created work in many different media, but I have always been led back to the same conclusion. There is nothing so durable, so inherently endowed with wealth of longevity and quality as metal." sculptures are coated with a clear lacquer that can be damaged with abrasive cleansers, metal polish or steel wool. If you must, use mild soap and water and a soft brush. 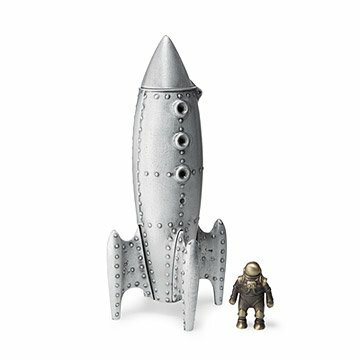 I just love everything about it my rocket bank and the little spaceman. The size is great too. I was looking for something to give my husband for his birthday and came across this. I wasn't sure at first, but am so glad I got it for him, he absolutely loves it! He actually uses it as a bank and it is a beautiful piece of art. He told me it is his favorite gift I have given him in our 20 years of marriage.